Plastic tote tank mixers and IBC (Intermeadiate Bulk Containers) mixers are a new class of mixer which are made possible by several Dynamix Innovations. Our Impeller technology, Mixer Mount and Coupling has enabled the plastic tote mixer to become a key quality control tool. The ITM Plastic Tote Mixer is part of the evolution from Stainless Steel Totes to Plastic Totes in many industries. Our experience with plastic tote mixers began with Stainless Steel Tote Mixers for the Automotive Industry. This unique focus and experience evolved into the Plastic Tote Mixer as a result of the demand for Quality Mixing in Plastic Totes. Whether you are using a Rotationally Molded Plastic Totes, or a Blow Molded Plastic Totes the Dynamix Tote Mixer line can be selected and applied for your process. 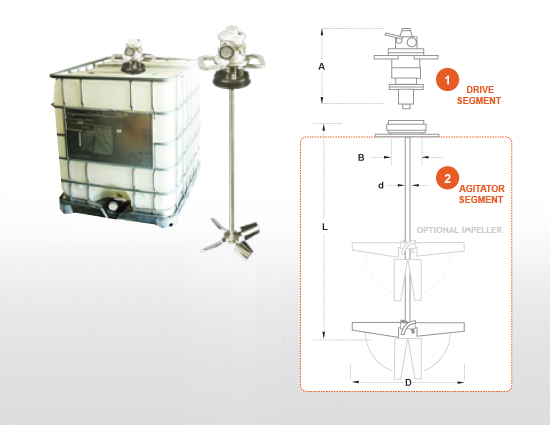 Our 4 Bladed Collapsible Impellers enter through the small openings of the plastic tote or IBC. These impellers expand during mixing and collapse after for easy removal. Impellers are availible in Dynaflow, Pitch and Radial type impellers. This ensures that the correct type of mixing quality will be achieved. Note: we do not have one single model for plastic tote mixing, we have tote mixers for each type of tote container and configurations to address all the challenges of tote mixing. If you are unsure of your tote or tank design just contact us directly or submit our request for quote with the information that you have.